Registration: Clinic ni Kuya Main, Monday to Friday, 4am-8am. Look for nurse Joven Nicol. LOOK: In partnership with Members Church of God International, volunteer groups and partners, UNTV News and Rescue visits Brgy. Talipan, Pagbilao, Quezon Province on February 2, 2018 to provide medical, dental, and other charitable services. Thanks be to GOD! The historic music album that turned Gold the day it was released is now Platinum and climbing. Be truly moved, especially to do good even for just one day, with the carrier single inspired by the equally phenomenal advocacy, Isang Araw Lang or Just One Day. Not the usual media man seen on screen, Kuya Daniel Razon is a real portrait of a seasoned broadcast journalist and public servant. Merging his bright ideas in broadcast and public service, he authored intelligent alternatives for Philippine media’s conventional style and programming. Be it on radio, television or big screen, the name Daniel Razon has now become synonymous with public service, hence earning the moniker as Mr. Public Service. Kuya Daniel Razon spent his hour getting life stories straight from a cab driver, a fastfood crew, a tricycle driver, a store vendor, a fish vendor, and a garbage collector - all in the street and in just one episode. With genuine pragmatism and practicality, Mr. Public Service puts on view a glimpse of reality and a piece of inspiration from our fellowmen and remarks on a fact that sometimes we forget to be thankful for what we have. With teleradyo (television radio) on the rise, classic radio's glory seems fading. Along with La Verdad AM radio broadcast launched through UNTV, Kuya Daniel Razon introduced a first-of-its-kind mobile radio booth to keep the intrinsic worth of radio and bring public service closer to people. 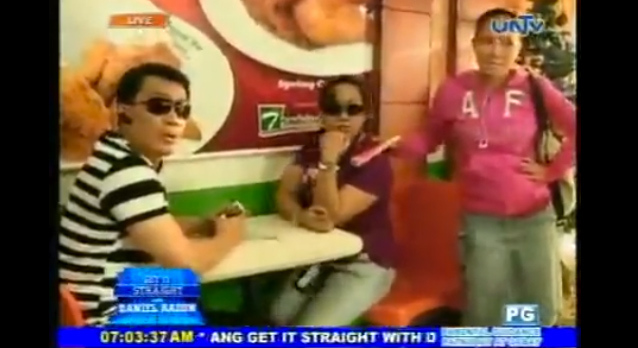 Munting Pangarap (Simple Wish) evolved from being a segment of Good Morning Kuya! to become one of UNTV’s flagship shows hosted by Kuya Daniel Razon. The show features stories of hope, survival, and second chances – culled from beneficiaries transcending various religious, linguistic, ethnic and racial boundaries. An advocacy for change, Kahit Isang Araw Lang is all about doing good even for just one day. By serving others with one’s capabilities, abilities, skills, and profession, a person can do a great amount of good. Began in 2009, the advocacy pioneered several firsts in the Philippines’ public service. Without discounting the importance of news casting, Tulong Muna Bago Balita (Rescue First, Report Later) redefines the conventional “get it first, get it right” media practice by putting the lives of the citizens on top of its news core values. Kuya Daniel Razon's free education initiatives through La Verdad Christian School provide formal learning to deserving yet poor students in the Philippines, Liberia, and Ghana. The first of its kind in the Philippines, La Verdad’s full scholars are entitled to zero-cost tuition and miscellaneous fees, free meals, uniforms, and books. From a desire to be of help to those who need medical assistance, Clinic ni Kuya Daniel was conceived. With at least 13 branches Philippine-wide, the free health clinic is one of the longest-running social care services of Kuya Daniel Razon through his morning show, Good Morning Kuya!.